Until today only two posts have appeared here concerning controversial SCOTUS nominee Brett Kavanaugh: Astro-Notes and an Eclipse for Judge Kavanaugh and Kavanaugh SCOTUS hearing a Jupiter-Neptune Affair (as in, frothy; attempting to fulfill a dream or vision - my guess: the end of abortion's rights in America, a complex issue where men shouldn't tread). 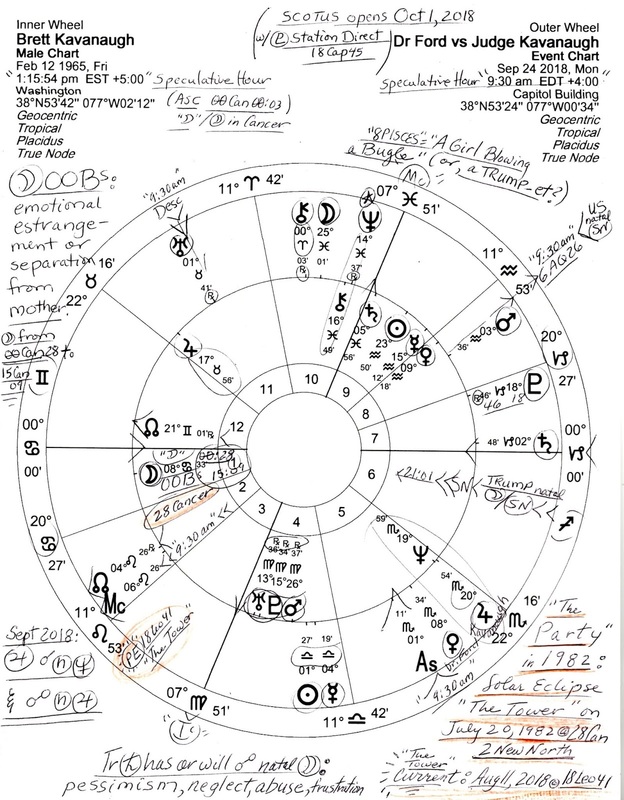 Circled on the chart is transit Jupiter @20Scorpio conjoining Kavanaugh's natal Neptune while opposing his natal Jupiter. A squishy foundation of overblown dreams'n'schemes! Oversell! 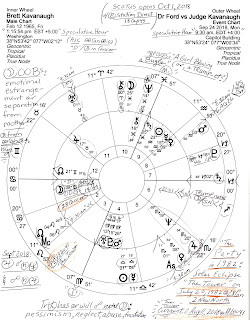 But he does have his Nodal Axis (21Gem/21Sag) conjoining that of Donald Trump which necessarily brings in Trump's natal Sun-Moon opposition on his Nodal Axis and suggests for them a cozy meeting of goals...is this a get-out-of-jail-free card for Trump with Kavanaugh On The Bench and following Trump's lead who is following the Kremlin's and China's lead? Now today here's another 'Kavanaugh post' showing a 9:30 am edt time (speculative hour) horoscope set for Monday September 24, 2018 Capitol Building in DC, the announced date when Dr. Christine Ford and SCOTUS nominee Brett Kavanaugh are scheduled to testify concerning a disputed event from 1982. A curious factor is that a solar eclipse in the Saros Series of the currently in-force Solar Eclipse (2 New North), which perfected August 11, 2018 @18Leo41, aka, 'The Tower Eclipse' for its *collapse of structures, lifestyles, or plans vibes, also manifested on July 30, 1982 (28Cancer). This may not be the Prenatal Solar Eclipse of the party and alleged assault but Dr. Ford has stated that she believes it occurred in 'summer of 1982'. See Timeline: How the Kavanaugh accusations have unfolded. Now some hastiness is clearly noticeable in Republicans' 'shove him through' behavior concerning this particular nominee, as you know, and to some degree this may be attributed to the fact the new SCOTUS term opens October 1, 2018 with Pluto in Capricorn Station Direct @18Cap45 and an unaspected Jupiter--factors I hope to discuss in a future post. * 2 New North's collapse theme: Brady's Predictive Astrology.